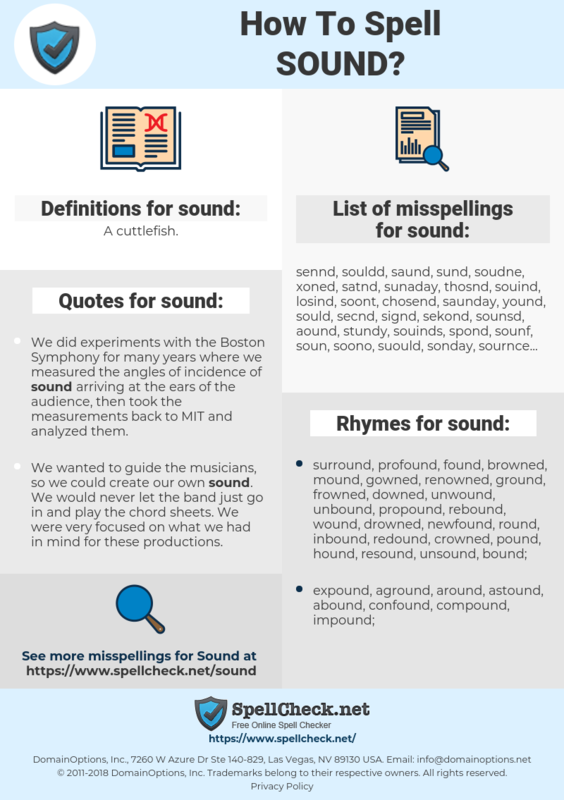 What are the misspellings for sound? What are the common mistypes for sound? What is the definition of sound? What are the quotes for sound? What are the rhymes for sound? What are the translations for sound? 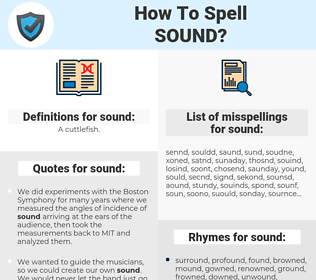 What are the common typos for sound? This graph shows how "sound" have occurred between 1800 and 2008 in a corpus of English books. Japan is quite weird because they wait for you to say something before they respond. You can literally hear a pin drop, they don't make a sound until you say something to the crowd. I worked very hard, but I think it's unfair to make it all sound like it's all David's fault. slaan, klinken, klank, degelijk, diep, gezond, grondig, gedegen, deugdelijk. sonder, fiable, responsable, volume, prudent, firme, profond, sonner, sain, sembler, rigoureux, son, valable, raisonnable, judicieux, bruit, sensé, faire sonner, retentir, sonore, sonores, solides, acoustique, rationnel, s'entendre, donner l'impression de. laut, Ton, Gut, einwandfrei, solide, fest, stark, stichhaltig, fundiert, gesund, Sound, Klang, Schall, Geräusch, intakt, ausloten, aussagekräftig, unbeschädigt, triftig, klingen, ertönen, lauten, sondieren, tief, unversehrt, stabil, fehlerfrei, treffsicher, Klangbild, Meeresarm, Meerenge, Mucks, Sonde, fehlerlos, zahlungsfähig, gediegen, solvent, kreditfähig, erklingen, tönen, einen Klang haben, sich anhören, erklingen lassen, loten, abklopfen, erschallen, ertönen lassen, erschallen lassen, abhorchen, mitklingen, Säge, tadellos, schallen, Audio. 音, サウンド, 鳴り, 無傷, ゾンデ, おんきょう, 健全な. mocny, brzmienie, cieśnina, odgłos, dźwięczenie. adequado, bom, barulho, soar, eficaz, consistente, fundamentado, racional, coerente, correcta, positivos, positiva, adequadas, rigorosa, sonoridade, áudio, sadio, corretas, sãs, equilibrada, ajuizado. звуковой, здоровый, качественный, звук, шум, звучать, издавать звук. sensato, sondear, correcto, adecuado, seguro, completo, tocar, bueno, profundo, acertado, prudente, parecer, sonido, ruido, de sonido, sano, sonar, equilibrado, positivo, sonoro, saludable, auscultar.